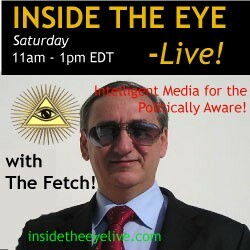 I will be guest hosting Dennis Fetcho’s Inside the Eye Live! program on Revolution Radio on September 28, 2013 from 10 AM to 1 PM Eastern. I am looking to have a featured guest for part of the show, and I plan to discuss economics and politics, with some talk relevant to the situation in the Middle East, given the flavour of the show, with Dennis Fetcho having regularly broadcast from Amman, Jordan, and now from Riyadh, Saudi Arabia. Dennis is a former fellow broadcaster on Oracle Broadcasting. For those of you who have been missing Lee Rogers’ unique and incisive commentary on his Live Free or Die Radio since his December 21, 2013 retirement, he’ll be guest hosting Inside the Eye Live! on February 16, 2013 at 11 AM Eastern. On January 27, I wrote the article, What Lee Rogers has been up to since his radio hosting retirement, about an article he had written for Blacklisted News, and his January appearance on Inside the Eye Live! Since then, he has written other articles, and appeared on Oracle Unleashed on February 2.